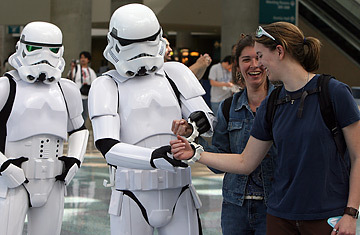 Star Wars fans gather on opening day of "Star Wars Celebration IV" in Los Angeles. Star Wars fans love to stand in line  for movie tickets, for Billy Dee Williams' autograph, for limited-edition anything. That much was clear Thursday, as a few thousand of them contentedly cooled their heels in a line that wound around the Los Angeles Convention Center on the first day of the largest Star Wars party in history, Celebration IV. The event, only the fourth official Star Wars fan gathering ever, marks 30 years since a fictional galaxy far, far away burst into our cultural consciousness and gave grown men an excuse to hang onto their toy collections. By Memorial Day, organizers expect more than 25,000 would-be Wookiees and stormtroopers to have joined the party in L.A. But it's not actually the waiting in line part that the fans love, says Steve Sansweet, director of fan relations for Lucasfilm. "They love to be together, to find comradery and friendship." And, let's face it, to compare their replica lightsabers. Celebration IV kicked off with a total-immersion program  a free screening of all six of George Lucas' Star Wars films back-to-back, a 17-hour marathon with intermissions, attended by 3,000 extreme fans. The better knowledge a fan has of the Lucas canon, the better he can appreciate the more esoteric of the Lucasfilm archive exhibits at the convention center. One of the most buzzed about items confirms a piece of Star Wars production lore: it's a clapperboard (that slate they bang together before a movie take starts) that says Revenge of the Jedi, the working title of Return of the Jedi until Lucas changed it weeks before the film's 1983 premiere because he felt Jedis do not seek revenge. Fans frantically clicked their digital cameras at a display case that showed the evolution of Darth Vader's costume  for this crowd, the nasty Sith lord's chest plate changing from green buttons to blue ones in between Episodes IV and V is as significant as Picasso changing from his blue period to his rose period. Those in touch with their dark sides rushed exhibits of tortured druids on a rack, Luke Skywalker's severed head and the Princess Leia slave costume, a fetching metal bikini that says, "Eat your heart out, Jabba the Hutt." For hipster Jedis  yes they exist  there was an exhibit called "The Vader Project," where 75 artists, including Paul Frank, Marc Ecko and a guy who calls himself Sucklord, customized Darth Vader helmets. The artists created a Statue of Liberty Vader, a Full Metal Vader with camo theme, a hip-hop Vader with a jewel encrusted grill and a black fleece Vader with an exposed pink fleece brain. Sucklord, a New York City artist who declines to share his "government name," used his helmet to construct a diorama of Tatooine, the desert planet that is the setting for most of the films. "I first saw Star Wars when I was 7," says Sucklord. "It set the tone for my artistic taste, my aesthetic world." And, Sucklord admits, there are commercial reasons for a starving artist to embrace The Force  "You have an audience." Activities like Ewok landscaping, LEGO building and droid races filled out the geek slate. Tom Jozwiak, 46, an engineer from Chicago, brought the R2-D2 he has been building for three years to race. "It's a hobby, a very time-consuming one," Jozwiak admits, in what is a frequent refrain among a culture of diehards with day jobs. The crowd was about 70% male, even more so in the droid builders group. But Nikki Miyamoto, a costume designer from L.A., brought the R2 she's been working on for two years, with brushed copper plates. A 24-hour Celebration Store fulfilled merchandising needs that could crop up at any hour of the day  like a Darth Vader zip-up hoodie for $40, a Star Wars Forever baseball cap for $15 or a limited edition (!) C-3P0 and R2-D2 action figure two-pack. Later in the weekend, celebs in the Star Wars world will be popping in, including Carrie Fisher and Anthony Daniels (C-3PO). And Lucas's special-effects gurus will dish some behind-the-scenes dirt on a panel. In the meantime, on the Jedi Training Stage, a new generation of fans was indoctrinated. A Jedi Master handed children brown Jedi robes and instructed them in lightsaber fighting skills. Yoda's teachings are refreshingly different from the "everybody gets a trophy" culture of little league. "Do or do not. There is no try," the Jedi Master told his young charges, before they lunged, ecstatically, at Darth Vader.